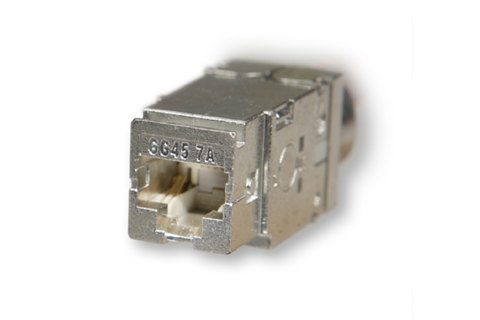 LANmark-7A GG45 is a screened RJ45-compatible cable jack speciﬁed up to 1000MHz. It is designed speciﬁcally to support the high frequencies required for applications beyond 10 Gigabit Ethernet. Combined with LANmark7A Cable and Patch Cords, LANmark-7A GG45 has double the frequency range and half of the crosstalk compared to Cat6A and provides excellent transmission capacity up to 50Gbps (4-times of Cat6A). LANmark-7A GG45 uses 12 contacts: 8 contacts for the 1000MHz transmission (GG-mode) and 4 additional contacts to ensure RJ45 compatibility (RJ Mode). Thanks to its 360° screening and a fully closed rear cover, the connector allows excellent coupling attenuation and ensures immunity from alien crosstalk and other external interference. The LANmark-7A GG45 connector ﬁts in all structural hardware designed for the Snap-In Connectors and can be used in all positions of a 4 connector twisted pair cabling channel (PP, CC,CP, TO). The LANmark-7A GG45 12C Snap-In Connector is the ﬁrst RJ45 compatible which meets the stringent requirements of Cat 7A up to 1000MHz. It has outstanding performance for Insertion Loss, Return Loss, NEXT/FEXT, Power Sum NEXT/FEXT, and especially Alien Crosstalk. When used in combination with Nexans LANmark-7A cables and LANmark-7A patch cords, the four-connector channel meets Class FA requirements as deﬁned in ISO/IEC11801 amendment 1. The LANmark-7A GG45 12C Snap-In Connector makes use of Nexans wire organiser and is therefore very easy and fast to terminate. Using the Nexans patented Easy Termination Tool for GG45 the termination of GG45 is fool-proof and very reliable. A stranded version is available to allow the use of ﬂexible stranded cable in cross connects or consolidation points. The LANmark-7A GG45 12C Snap-In Connector is covered by the guarantee as described in “The General Terms and Conditions of Sales”. When installed in combination with other LANmark-7A components, a 25 years channel warranty can be obtained, covering full Cat 7A/Class FA compliance.